Using radio telescopes in the United States and Europe, astronomers have made the most detailed images ever of Hydrogen gas in a spiral galaxy other than the Milky Way. 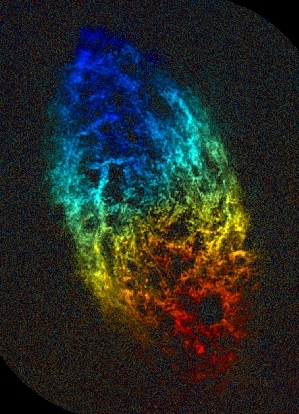 The scientists used the National Science Foundation's Very Large Array (VLA) radio telescope in New Mexico and the Westerbork Synthesis Radio Telescope (WSRT) in the Netherlands to produce an image of the galaxy M33, known to amateur astronomers as the Pinwheel Galaxy. "An image with the level of detail we have achieved opens the door to learning fundamental new facts about the relationship between massive stars and the galaxy's complicated gaseous environment. 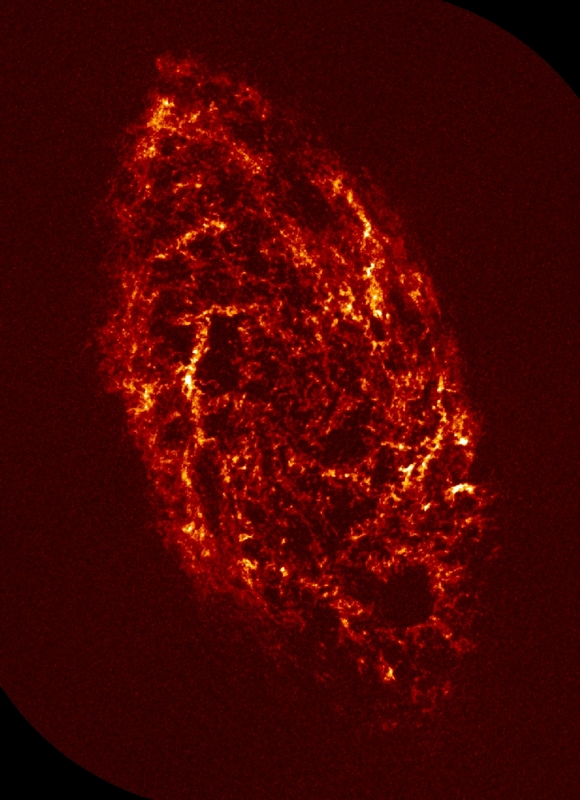 This, in turn, will help us better understand how galaxies age," said David Thilker, of the National Radio Astronomy Observatory (NRAO) in Socorro, NM. Thilker worked with Robert Braun of the Netherlands Foundation for Research in Astronomy and Rene Walterbos of New Mexico State University in Las Cruces. The scientists reported their findings today at the American Astronomical Society's meeting in San Diego, CA. The VLA and WSRT received radio waves at a wavelength of 21 centimeters that are naturally emitted by Hydrogen atoms. 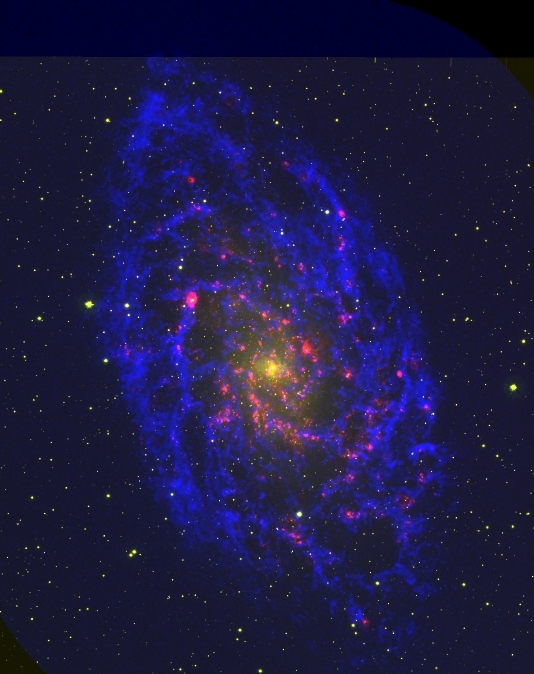 Using this data, the astronomers produced images showing the distribution of neutral atomic Hydrogen in M33. In addition, because the atoms emit at a very specific wavelength, the scientists could detect the galaxy's rotation by tuning the telescopes' radio receivers to receive radio waves whose length has been changed by Doppler shifting. The new images show details of the galaxy smaller than 130 light-years. "With more computer processing, we will be able to see features as small as 65 light-years," Thilker said. "This, we believe, will allow us to see 'bubbles' in the galaxy's gas that have been inflated as the result of one or more supernova explosions," Thilker added. At a distance from Earth of about 2.7 million light-years, M33 is a member of the Local Group of galaxies, which also includes our own Milky Way and the Andromeda Galaxy. With a diameter of about 60,000 light-years, it is roughly half the size of the Milky Way. Under vary dark skies, people with excellent vision can see M33 with the unaided eye. With common amateur telescopes, its spiral arms can be seen.